The Indonesia government announced Monday how the sanctions on Russia are an opportunity for the nation to boost their trade. Indonesian Ministry of Trade spokesman Marolop Nainggolan said a memorandum of understanding for the barter was signed Aug. 4 in Moscow between Russia’s Rostec and PT. Perusahaan Perdagangan Indonesia to barter. Both entities are stated owned. “This is an opportunity that should not be lost from our grasp,” Nainggolan said. 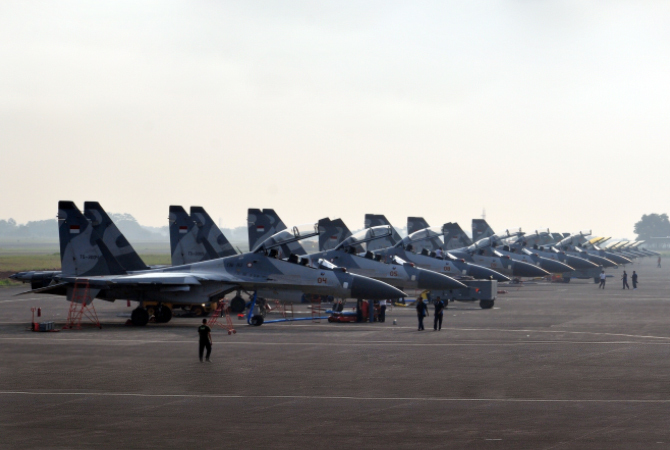 The Indonesia airforce has 16 Sukhoi jets, (pictured above Su-30MK2 and Su-27SKM, 5th wing, 11th squadron, Indonesian Air Force. Sultan Hussanuddin air base). They have form in the sanction opportunity business. Back in 2003 Indonesia was subject to a U.S. embargo on arms sales due to the military’s human rights abuses and bought the jets from Russia despite the ban. Of the current deal the Indonesian defense ministry said earlier this month it had been finalized but didn’t reveal on what terms. Responses like this with Indonesia show how sanctions f=generally fail other than a headline for the public, it provides opportunities to those outside previous deals or to sure up old or new allies. Free trade at work you might say.